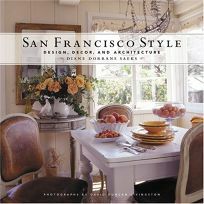 Architecturally, San Francisco style encompasses elements ranging from Victorian to modernist. Aesthetically, it varies, yet some driving forces persist; namely, ""personal style, individuality and dream-fulfillment."" In this lush volume, Saeks, California editor of Metropolitan Home, explores some San Francisco homes that are perfect examples of that variety and sense of distinctiveness. She begins with a Pacific Heights residence that overflows with historic grandeur (think museum-worthy giltwood mantles and a sumptuous George II armchair) and then moves on to a South of Market loft that epitomizes the ""polished ideal of city living"": refined raw silk shades, a ""chandelier"" made of paper and wire, a bathroom floored in teak decking. There's also a Nob Hill apartment, accented with a calm and subtle decor; a charming Sausalito cottage; and an Oakland Hills home stocked with furniture and decorative accessories created by its owners. The interiors Saeks chooses to highlight are overwhelmingly high-end yet, regardless of readers' aspirations, the book will surely remind them of the rewards of taking an innovative approach to design.